I never used to seek advice from other writers. In fact, I actively avoided it. I was afraid of criticism. However, someone at some point gave me three very powerful words to chew on: grow up, Hannah. So, I did. The only tricky part was finding the advice that worked for me. Luckily, we live in a world where hundreds of successful authors have an online presence and are happy to offer the tricks they’ve picked up. I began to read articles by Neil Gaiman, Stephen King, and J.K. Rowling, among many others. Above all things, they told me, no one can tell me how to write my story. No one can write it but me. However, they did have a few simple tips, which I’ve collected. These tips have helped me improve my writing immensely. So, here they are. Feel free to steal/borrow them. They aren’t mine, after all. Reading is a great way to improve writing. This is where being an English literature student helped me out. I was already trained in how to pull apart a book and read it critically, so doing that as a writer was very familiar to me. I started reading more. I read the genre I wanted to write. I read the genres I didn’t want to write. As I read, I started to write in margins, making note of things I liked or didn’t. I read for fun and I read to learn. The most I’ve learned about the writing process has come from examining other writer’s work. Being a writer does not mean I only write when I’m inspired. Forming a writing habit is super important. Writing often has allowed me to put the time in to develop my voice. Also, getting in the habit of writing means that even if I’m not inspired, I still produce something. I try to write every week day, but leave my weekends free. I’ve heard it often said that a good writer writes something everyday. George R.R. Martin has admitted to writing on holidays. I’ve heard other writers say they even write on vacation. Yes, taking criticism is hard. It’s been the hardest of these tips for me, but I’m so much better for it. The good professors I had in college were the ones who discussed papers with me in their office hours. The best professors gave me low grades and told me I could do much better. The trick to taking criticism is to separate yourself from your work; try not to take it personally. A good beta reader/reviewer will want to make the book better. They think their advice will help. So, I let them help. My husband David pretty much reads everything I write down on paper (he reviewed this blog post before it went live). He’s brutal, but I trust him to be honest and work with me to produce the best thing I can. When Footfall is at a place for beta readers, I’ll find a few passionate people to help me make this book better. This person really should have gone through a beta reader first. Grammar, punctuation, syntax, etc. are all key components to writing. Working as a technical writer, I’ve found that I’ve learned more about these things from reading other people’s work than from reviewing my own. Having a clean manuscript, free of spelling errors and punctuation mistakes, will be one thing in my favor when I send it off to an agent for the first time. This may seem fairly obvious, but I can’t stress enough the many benefits of finishing a project. My computer’s hard drive is full of well-intentioned, half-finished stories. I gave up on them because I lost steam. Over the years, the sight of all those unfinished stories created a seed of doubt in my mind. Maybe I was a bad writer? Maybe this wasn’t the path for me? I lost confidence in myself and what I thought I could produce. Then, I finished NaNoWriMo for the first time (I’ve plugged this event before. Read about it here.). The confidence boost I got from finishing was enormous. Then I did it again the following year. Now, those were just early drafts, and I still haven’t finished Footfall. However, I know I can finish and I know that I will finish. There you have it. Five things that made me a better writer. 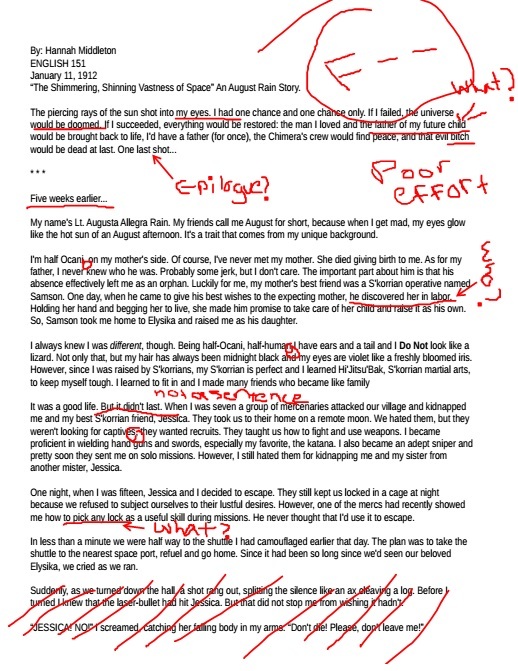 Do any of you guys have writing tips? Let me know in the comment section below! Great tips. I think #1 is most important… not just reading, but reading critically and reading WIDELY. Reading outside of your genre, reading nonfiction as well as fiction, etc. I also think that while reading is most important, consuming other forms of stories critically can be valuable too. Television and movies have some stellar examples of strong storytelling, and I’m a colossal fan of radio, which is extremely word-focused since there are no visuals to work with.